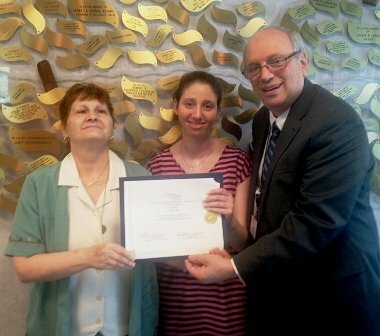 Long Island-Based ACLD Honored as "Agency of the Year"
Bethpage-headquartered Adults and Children with Learning and Developmental Disabilities, Inc. is recognized as Agency of the Year by Self-Advocacy Association of New York State, Long Island Region. Bethpage, NY - August 13, 2015 - Adults and Children with Learning and Developmental Disabilities, Inc. (ACLD), a leading Long Island-based not-for-profit agency devoted to supporting the pursuit of an enviable life for children and adults with autism, learning and other developmental disabilities, was recently honored with the Long Island Award for Agency of the Year from the Self-Advocacy Association of New York State (SANYS), Long Island Region. SANYS is a not-for-profit, grassroots organization run by and for people with developmental disabilities with the goal of creating a person-centered and person-directed system of supports. ACLD received The Agency of the Year Award in recognition of its aim to give a voice to those it serves through self-advocacy and enabled groups within the organization. According to Roseanne Tast, ACLD’s manager of Quality and Person-Centered Projects, the honor recognizes ACLD’s Advocacy Officers and Advisors for their efforts in building a foundation that promotes advancement and empowerment. As part of its self-advocacy, individuals supported by ACLD have been involved in several agency-wide initiatives, including the recognition of Autism Awareness Month, participation in a range of agency workgroups and participation in the interview process for prospective employees. Adults and Children with Learning and Developmental Disabilities, Inc. (ACLD) was founded in 1957. The 501(c)(3), not-for-profit agency serves the needs of more than 3,000 children, teens and adults with learning disabilities, autism and other developmental disabilities, and provides support for their families. ACLD's mission is to provide opportunities for individuals with disabilities to pursue enviable lives, increase their independence and improve the quality of their lives within the community. ACLD employs more than 1,100 people and operates 77 different program sites including group homes and apartment programs across Nassau and Suffolk Counties. Service programs include early childhood services, day habilitation, residential alternatives, vocational training and job placement, recreation programs, respite, family support services, Medicaid service coordination, and medical and behavioral health services. Pictured: (from left to right) ACLD Suffolk Day Council President Carmen Pumo, ACLD Suffolk Day Council Secretary Lauren Meisler and ACLD Executive Director Robert C. Goldsmith accepting the Long Island Award for Agency of the Year from the Self-Advocacy Association of New York State (SANYS). Subject: LongIsland.com - Your Name sent you Article details of "Long Island-Based ACLD Honored as "Agency of the Year""